Lent begins Wednesday!!!! Of all the seasons of the church’s year, Lent is the most distinctive and one of my favorites. The purple vestments, the ashes, Stations of the Cross, Confession, Fish Fry’s, and ‘giving up something for Lent’ all stir up good and warm memories for us. During the forty days of Lent we try to get back to the basics of being a Christian and we try to have a fresh start. It’s a time for us to pause and look deep inside and do an honest and searching moral inventory – and to try to make some changes. So if Lent begins this week, that means Wednesday is Ash Wednesday!!! This year we have a change in our morning Mass time for Ash Wednesday – OUR ASH WEDNESDAY MORNING MASS IS AT 9AM THIS YEAR. 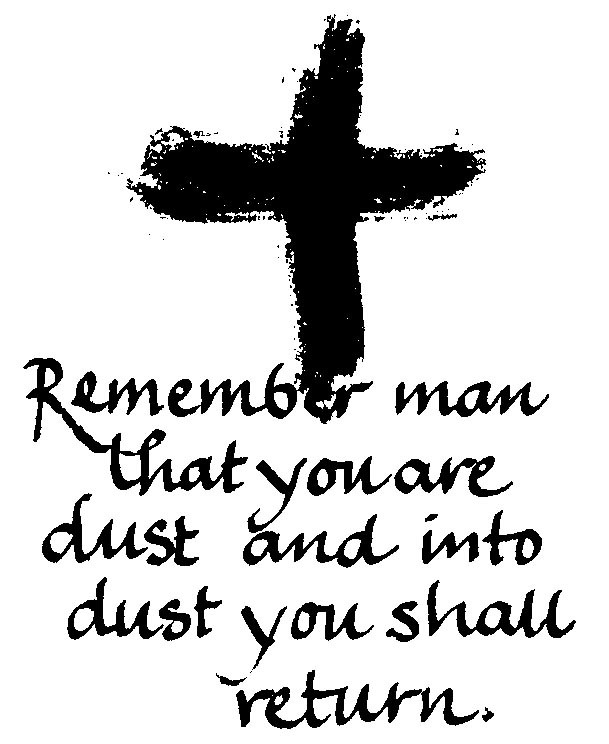 We also have an evening Ash Wednesday Mass at 6:30pm. Ash Wednesday is a day of fasting and abstinence. Fasting means that adults between the ages of 19-59 are allowed to eat one full meal, as well as two smaller meals that together are not equal to a full meal. Abstinence means that if you are 14 years old and older, you must abstain from meat. All Fridays during Lent are days of abstaining from meat. If you’re looking for something to strengthen your spiritual life this Lent – we’ve got plenty of opportunities!!! Every Wednesday night we’ll have Mass at 6:30pm. Stations of the Cross will be every Thursday at 5pm followed by Benediction. Our school students have Stations of the Cross every Friday at 1:45pm and all are welcome to join them. Our Bible timeline is continuing (you can jump in anytime!) on Thursday evenings at 6:30pm in the library. Our Parish Penance service will be later on in March – more on that as it gets closer. I hope everyone has an AWESOME Lent as we spiritually prepare for the holiest day of the year – Easter!!! LET”S PARTY!!!! Before we fast on Ash Wednesday, we need to eat A LOT the night before – they don’t call it Fat Tuesday for nothin’!! Our Mardi Gras party has been canceled the last 2 years because of snow – that’s not gonna happen this year!! Mardi Gras will be this Tuesday night, February 28 at 6:30pm in the gym. It’s a pot-luck – see the full-page advertisement later in this bulletin for details on who brings what. Well, it’s here…..our first FISH FRY is this Friday!!!!! WOO-HOO!!! I saw the CodFather last week – his suit is pressed and his sunglasses are ready, but he’s still tryin’ to find his giant fish!! Sometimes he’s kinda hard to understand through his thick Sicilian accent, but he said WE NEED VOLUNTEERS!!! He may have said something about cement shoes if we don’t volunteer. Our Slaw-Slingers are always in need of additional help – they meet at 1pm on Thursday afternoons to pack cole-slaw, pickles, condiments, etc. I love slingin’ slaw!! – it only takes about an hour and a half and it’s a lot of fun!!! We’re also lookin’ for people to fry fish in the fish hut – if you’re interested give Damian Weller a call – 859-393-3010. If you like to bake, we need as many desserts as we can get – cakes or pies or cupcakes or anything else – just drop them off in the school office on Thursdays or Fridays. To sign up as a volunteer for the Fish Fry just go to http://signup.com/go/Y3hHMF or give Jenny a call at 525-6909. The CodFather says THANK YOU for making our Fish Fry THE BEST!!!! As most of you know, Fr. Niby is away on a pilgrimage to the Holy Land. When that’s finished, he’ll be staying in the Holy Land for another week for a silent retreat. For some reason, I have trouble imagining Fr. Niby doing a silent retreat!! Please pray for him during his time away – he’ll return on March 9 – and I’m sure he’ll have a ton of stories!! !